Excellent product, exactly as pictured. 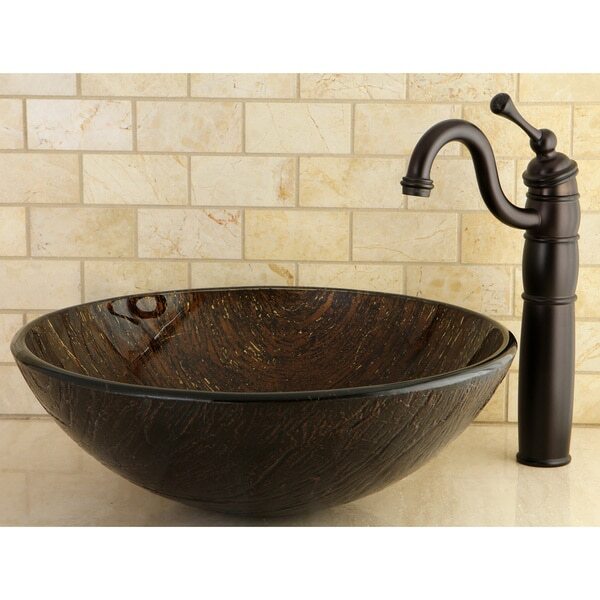 Evoke the casual decadence of an ancient era with this dark bronze tempered glass bathroom sink. The swirling pattern in this vessel bathroom sink complements any classy bathroom with a subtle sophistication. The delicate appearance of the tempered glass belies its strength and sturdiness. The deep bowl of the sink provides ample room for washing and protects the rest of the bathroom from extraneous water. Faucet and pop-up drain sold separately. Sink is absolutely gorgeous. As beautiful as other sinks that are 3x the price in plumbing supply showrooms As a bonus the bronze faucets are very nice too. We are redoing our bathroom and putting Granite countertops in. We wanted to find a vessel sink that had character but would not compete with the counter top. This sink is great and we are more pleased than expected. Love this glass vessel sink . Beautiful color and sophisticated modern look , Other than that I would recommend this bathroom sink .Look great in my master bathroom. Nice product...Great quality at a great price. Looked even better than than the picture. My first freestanding sink. Very impressed. While my experience with freestanding sinks is limited thus far to this purchase, I was extremely impressed with the look, detail, heft and overall quality of this product. When purchased in combination with the tall faucet, all necessary components were supplied to mount sink. Obviously that doesn't include the pee trap but that should be expected. Very impressed. Good buy. We ordered two of these sinks for our new Master bathroom. Our bathroom is painted a golden tan color and this sink has subtle flecks of a golden color in it. They are beautiful!! After all the remodeling we did with this bathroom this sink by for is incredible. It is the talk from all guest when they enter. We love it & highly recommend it. Love these and they look amazing although they spot terribly. This sink looks beautiful in or cabin half bath. I love the color of the sink. it's been 3 years since we purchased it and I am still in love with it. Beautiful Vessel basin! This basin is sturdy and will add a unique touch to any bathroom. I bought two of these for my master bathroom and they are gorgeous. They are well made and go well with the VIGO rubbed bronze faucets I purchased. The design/texture is subtle. I'm very happy with my purchase. "What is the weight of this sink? and...the weight of the faucet shown in the picture?" "Can someone provide me with options for a bronze pop up drain that will fit this sink?" "Can I get this sink in a 14" diameter, with approx. 5" tall/depth bowl? Thank you, Kelly"
"I like the faucet pictured with this sink better than the faucet offered to purchase with the sink. Can you please tell me how to find the faucet that is in the photo?" "I noticed this item and a previously asked question was as to whether the faucet came with it. but the product number was for the sink what is the faucets number"
Hello mcgillen, the faucet item number is # 15653788. Have a great day! "Does it include the faucet?"